The top ten countries in descending order are: Iraq, Afghanistan, Pakistan, Nigeria, Syria, India, Somalia, Yemen, Philippines, and Thailand. Over the past few decades, Muslims have faced a lot of scrutiny and hatred from most of the world due to the actions of religious terrorist groups, such as the Afghani and Pakistani Taliban, Al-Qaeda, Boko Haram, and ISIL. While the driving force behind the actions of these terrorist groups is Wahhabism, a religion that has a very extreme and ultra conservative interpretation of Islam, mainstream Islam actually forbids the killing of innocent civilians and promotes peace. 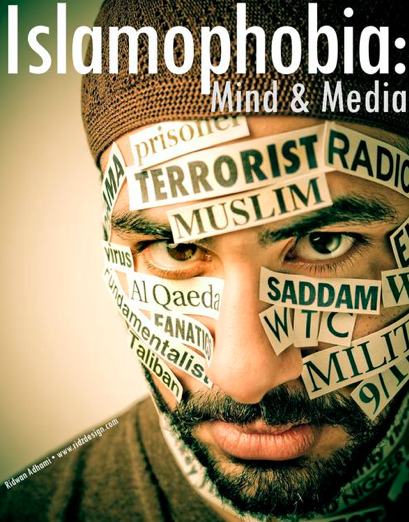 However, according to the European Network Against Racism, “Islamophobia is widespread and prejudice against Muslims has been greater and more visible than that experienced by any other religious or ethnic group”, even though religious terrorism is very much prevalent in other religious and ethnic groups today. The Council on American-Islamic Relations has noted that even within the US, in 2013 alone, 36 bills or amendments that aimed to vilify Islam were introduced in 16 states. Brigitte Gabriel claims that 25% of the 1.4 billion Muslim followers are radical Islamists, yet she herself appears to be Islamophobic based on her own definitions of what constitutes as radical Islam. So, why has there been an increase in Islamophobia? 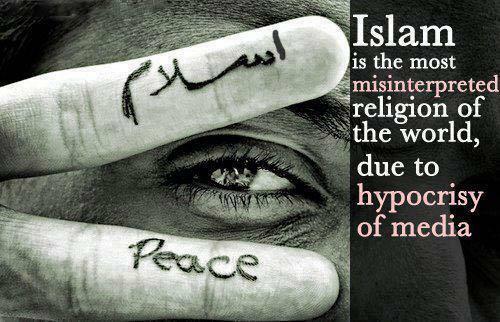 Why are all Muslims being held responsible for the actions of minority groups? Religious terrorism dates back to the beginning of time and includes other religious groups apart from Islamic extremists. For example, the Christian Crusades, known for its massacres during the Middle Ages, lasted for many centuries and gathered soldiers in the name of Christ. Also, the Sicarii Zealots were a Jewish extremist group that tried to expel the Romans and their sympathizers from the Roman province of Judea at the beginning of the 1st century AD. Moreover, between the 13th and 19th centuries, the Thuggee cult, a group of worshippers of the Hindu Goddess Kali (the destroyer), were rumored to have murdered over 20,000 victims a year. And, we can’t forget about Adolf Hitler, who was named the top terrorist of all time by a NewsOne article for killing over 12 million Jews in concentration camps and civilians in WWII. Other top terrorists named in this article include Mao Zedong, Osama Bin Laden, Joseph Stalin, Sadaam Hussein, Idi Amin Dada, Genghis Khan, King Leopold II, Benito Mussolini, and Suharto because the death tolls ranged from 4,000 (Osama Bin Laden) to 60 million (Mao Zedong) people as a result of these individual’s actions. 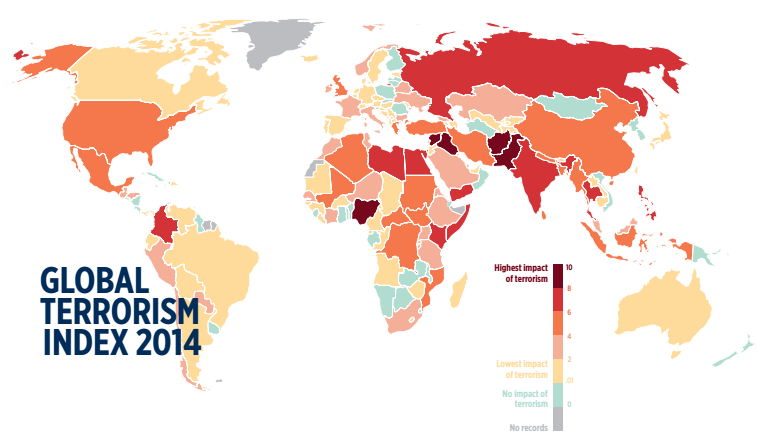 According to a recent article in the Guardian, this year’s Global Terrorism Index (GTI) claims that deaths linked to terrorism has increased by 60% in just one year, leading to a fivefold increase in terrorism since the 9/11 attack. 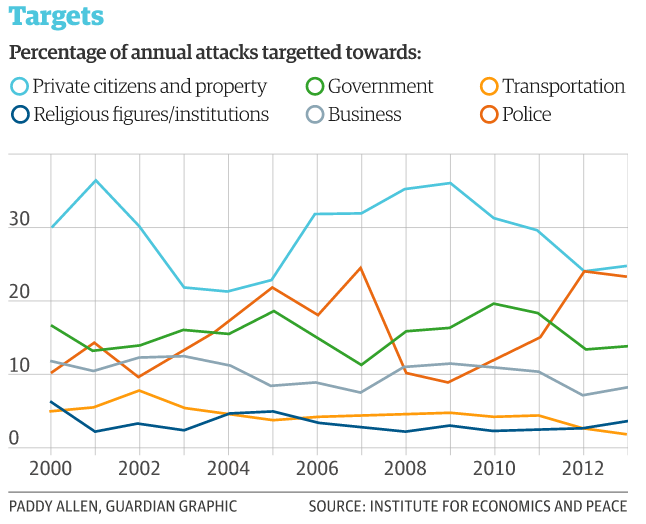 Moreover, religious terrorism, in particular, has significantly increased over the past few years and innocent civilians have been the biggest targets. In present day, apart from Islamic terrorism that the media focuses its attention on, Christian terrorism, Hindu Radicalism (saffron terror), and Jewish terrorism are all examples of intolerance and extremism that also exist in our world. 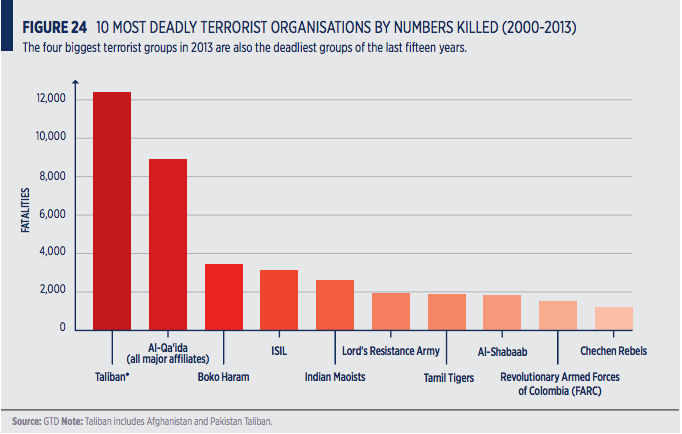 According to Vision of Humanity, half of the top ten deadliest terrorist organizations between 2000-2013 were extremist Islamic organizations while half were not. The Indian Maoists, Lord’s Resistance Army, Tamil Tigers, Revolutionary Armed Forces of Colombia, and Chechen Rebels were among the half that were not extremist Islamic organizations. Over the past 13 years, Islamic terrorist groups have killed approximately 30,000 individuals whereas non-Islamic terrorist groups have killed approximately 10,000 individuals. That being said, these findings should not justify Islamophobia. We live in a world where news outlets and social media dominates the way information is presented and controls what people see. One-sided news stories are much more common than completely unbiased stories with all the correct facts. It is very easy to take a comment or quote out of context and twist information depending on what you want people to believe. Our world has survived the Christian Crusades, Nazi Regime, Thuggee Cult, and Sicarii Zealots. Now, our world faces a major problem with the rise of Islamic radicalism. The real question is: Will our world learn from the mistakes made in the past with these previous terrorist groups that put the world through centuries of terror, or will we make the same mistakes that will just extend the time of terror we have to endure? According to the Vision of Humanity, the top three causes of terrorism are state sponsored violence, group grievances, and high levels of criminality. They claim that 83% of terrorist organizations that have ended since the 1960s ceased to operate due to policing and politicization, whereas only 7% ended due to military intervention. The Vision of Humanity also recommends that the best way to combat terrorism is by taking a holistic approach through preventive measures, stigmatization, application of international humanitarian law, better control of trade, addressing the needs of victims, addressing the financing of non-state actors, and embarking on campaigns of education and outreach. Education plays a major role in combatting terrorism, especially since terrorist use education as a brainwashing tool to recruit massive numbers of followers. Many proponents of education like former British Prime Minister and founder of the Face to Faith Foundation, Tony Blair, also emphasizes the fact that terrorism can only be defeated through education. 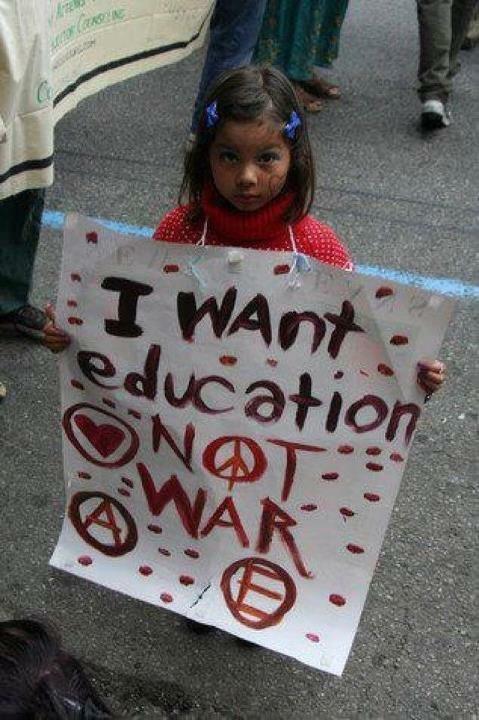 Advocates of the “education, not war” concept generally promote the idea of peace education, which includes conflict resolution training, human rights education, and democracy education, as a part of the solution.